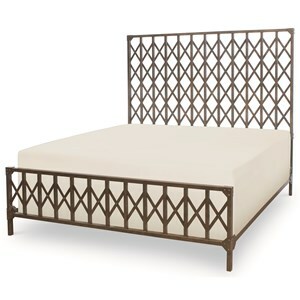 This bed feature clean, modern lines make for an updated rustic look. 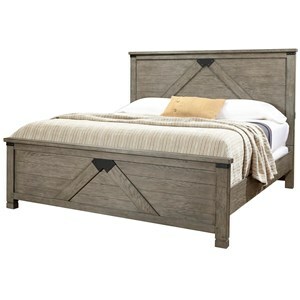 Bring a little bit of lodge into your contemporary home with the bed's worn wood finish and metal accents. A slatted headboard gives depth to the piece and your room, while the low-profile frame and footboard nicely fit a more open floor plan and clean aesthetic. Give your bedroom a rustic-chic makeover with this low profile bed. 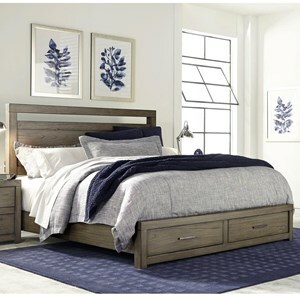 The Viewpoint King Low Profile Bed with Slat Headboard and Metal Accents by Emerald at Colder's Furniture and Appliance in the Milwaukee, West Allis, Oak Creek, Delafield, Grafton, and Waukesha, WI area. Product availability may vary. Contact us for the most current availability on this product. B977-12FB Eastern 6/6 Or California King 6/0 Panel Footboard 1 80" 86" 55"
B977-12R Eastern King 6/6 Bedrails 1 80" 86" 55"
B977-12HB Eastern 6/6 Or California King 6/0 Slat Headboard 1 80" 86" 55"
Finish The Driftwood finish is applied to pine solids and oak veneers and then hand rubbed with a white glaze. A pre-treatment of the wood called wire brushing, adds depth and character to the finish. Handles & Hardware Flush mounted metal hardware. Case Detail Moderate tapering on legs and bases. Drawer / Shelf Construction Drawers feature dovetail construction with finished interiors. Drawer Suspension All drawers have full extension ball bearing side guides for easy operation. Case Construction Constructed from pine solids and oak veneers. A blend of contemporary and industrial styling makes this bedroom and dining collection the perfect pick for either casual or formal spaces. The simplicity of each frame is covered in a uniquely rubbed finish to add texture and depth. Whether you're looking for fashion, function, or quality, you will find it in this collection. Mix and match throughout your home for an updated look you are sure to love. The Viewpoint collection is a great option if you are looking for Rustic Contemporary Casual furniture in the Milwaukee, West Allis, Oak Creek, Delafield, Grafton, and Waukesha, WI area. Browse other items in the Viewpoint collection from Colder's Furniture and Appliance in the Milwaukee, West Allis, Oak Creek, Delafield, Grafton, and Waukesha, WI area.